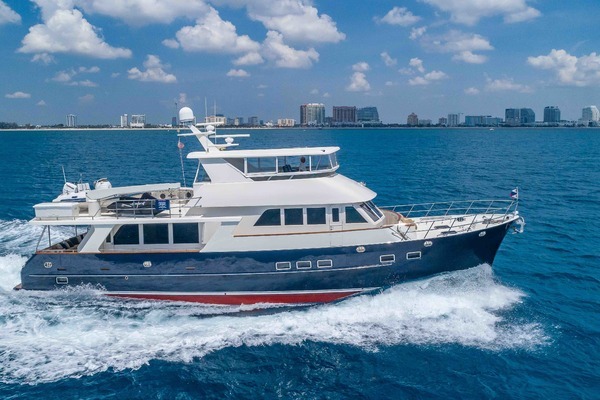 Voyager is a comprehensively equipped yacht built for extensive cruising and excellent fuel economy. She has benefited from a major refit in 2007 and 2015, before she crosses the Atlantic on own keel. The actual owner invested nearly € 800.000,- to make her ready for long trips. With her beam of 7.2 m, Voyager has an impressive volume and a flexible layout. Due to permanent crew on board, she is always ready for a viewing! United Yacht Sales New Jersey would love to guide you through a personal showing of this 82' Custom 84 Explorer 2004. This yacht for sale is located in Denia Spain and priced at $1,490,000. For a showing please contact us by filling out the form on this page and we will get back to you shortly! Main Deck: Galley forward with day head to port and access via stairs to wheelhouse Saloon: Roomy and comfortable area aft with ample seating and low coffee table. Entertainment unit to port with rise and fall TV. Dining area forward with ectendable table to seat up to 8 persons and semi open plan galley leading to wheelhouse and day head. Access from saloon to lower deck. Excellent visibility from large saloon windows. Access doors aft to cockpit. Lower Deck Guest Cabin: VIP Forward via access stairs located in wheelhouse. Large double berth with ensuite facilities and ample stowage. Master cabin accessed from aft stairwell lower lobby (2 Safes). King size berth with ensuite and owners settee. Guest cabin to starboard with double berth and ensuite. Lower lobby utility cupboard and linen cupboard, washing machine and dryer. Lower Deck Crew Cabins: Twin berth cabin forward with ensuite facilities Wheelhouse: Full instrumentation with raised seating area and table aft. Full chart draws stowage and two access doors to both side decks. Access aft to upper deck Upper Deck: Twin berth cabin to starboard with ensuite facilities (1 Safe). Access to flybridge forward and doors aft to open deck space with tenders and sunbathing area.